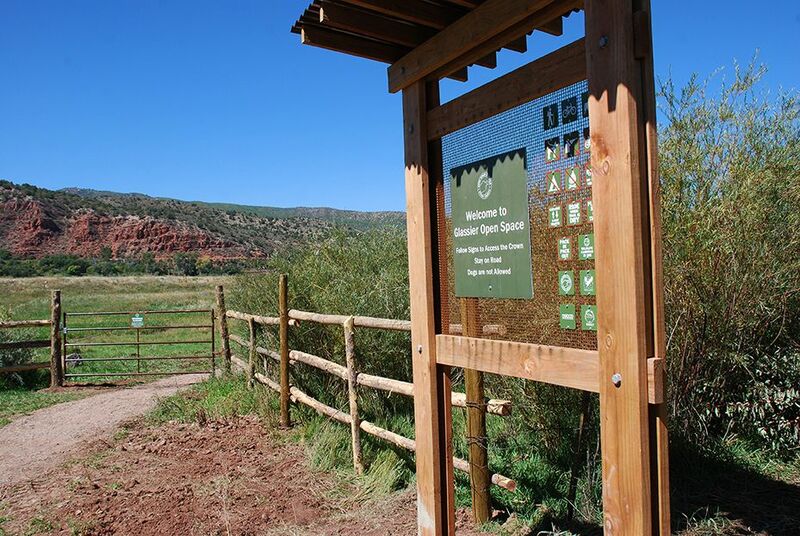 This kiosk marks the entrance to Glassier Open Space from the Rio Grande Trail. New trailhead parking (above) for Glassier Open Space debuted in early June, though some finishing touches remain to be done. The lot, at Hooks Lane and Hooks Spur Road, accommodates bicyclists, hikers and equestrians pulling horse trailers. No parking is available on the open space itself. The new trailhead greatly increases the available parking at this corner, where limited parking to serve the Rio Grande Trail has long been located across Hooks Spur Road from the new parking area. A horse trail and the Rio Grande Trail are available to reach Glassier Open Space from the trailhead. New trails were constructed in 2016 at Glassier Open Space. Separate routes divide mountain bikers and equestrians as they climb or descend from the Crown, where the BLM boundary separates the open space from federal land (see the map below). Signs designate which trail is open to horses and which is open to bikes. Hikers may use either route. From the Rio Grande Trail, look for the kiosk (shown at right) to enter the open space. In 2015, the first year of use at this open space property, Pitkin County approved six agricultural leases at Glassier Open Space. The operating plans for each lease area are outlined in the Ag Lease Summary below; the leased areas are detailed in the map below. Anglers must park at the public parking area and walk to Glassier Open Space to access the Roaring Fork River. Respect private property boundaries. No hunting. Non-motorized hunting access is allowed. Hunters accessing the Crown on foot from Glassier Open Space must keep weapons unloaded while on Glassier property. Weed-free feed required for horses, consistent with BLM requirements on the Crown. Special events: Any event involving more than 15 people must obtain a permit from Pitkin County Open Space and Trails. Up to 2 events per year are allowed. No event infrastructure is allowed at Glassier Open Space. Trails will remain open to public during events. Nearly 4 miles of new trails have been constructed at Glassier Open Space. There is a new entrance (the purple) for trail users. Once at the base of the Crown, mountain bikes go left (orange) and equestrians veer right (yellow). This map shows six agricultural lease areas at Glassier Open Space (click to enlarge).